Late-night comedians devoted parts of their routines on Thursday to lamenting the Federal Communications Commission's repeal of Obama-era net neutrality rules, slamming the move as "sad" and "despicable." 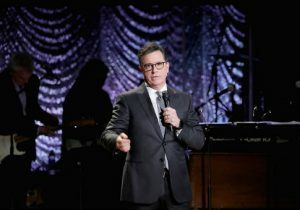 CBS host Stephen Colbert said it was a "sad day" for internet users in his opening routine, which his YouTube channel called "R.I.P. The Internet." "By killing net neutrality, internet providers can basically do whatever they want, as long as they disclose to their users what exactly they do to web traffic," Colbert said. Jimmy Kimmel said the FCC's decision was "absolutely despicable." "Big corporations are about to take full control of the internet, so Merry Christmas, everybody," Kimmel said, to no laughs. He added in a pitch for people to sign up for Obamacare before the deadline at the end of his side-splitting routine. NBC's Seth Meyers warned there were "potentially disastrous consequences" for the decision, although he did not lay out exactly what those would be. "Net neutrality ensures an open and democratic internet, where people can make and access content equally," Meyers said. The late-night hosts also personally attacked FCC chairman Ajit Pai. Colbert showed a picture of Pai, calling him a "big and tall tooth model," while Kimmel referred to him as a "jackhole." The FCC voted Thursday to return to the "traditional light-touch framework in place until 2015," when the Obama administration imposed net neutrality regulations, which classified internet service providers as utilities, rather than information services, giving the government broad power to regulate them and how companies manage traffic over their own networks. The FCC said the net neutrality rules had led to "regulatory uncertainty, less investment in broadband, and hampered innovation among smaller ISPs [internet service providers] in rural areas." The Washington Free Beacon reported that Pai's Restoring Internet Freedom proposal "will still require ISPs to disclose to their consumers if they block or throttle traffic over their networks."